The Obama administration is turning up the heat on Chinese government hackers over allegedly stealing trade secrets that cost U.S. companies billions of dollars each year and undercut American jobs. "Success in the international marketplace should be based solely on a company’s ability to innovate and compete, not on a sponsor government’s ability to spy and steal business secrets," U.S. Attorney General Eric Holder said Monday at a press conference. While the Department of Justice charged five officers of the Chinese People’s Liberation Army (PLA) of "computer hacking, economic espionage and other offenses," on Monday, this problem goes way deeper than just a handful of hackers. How big of a problem is cyber espionage? Last year, the FBI notified more than 3,000 companies that they had been the victims of cyber-attacks. While Russia has been implicated in some of them, China is by far the biggest player. The size of China’s cyber-espionage operation is unclear. But a report released last year by the security firm Mandiant claimed that the PLA employed thousands of hackers devoted to stealing trade secrets. Why is the U.S. government getting involved? One word: jobs. Cyber-espionage costs U.S. companies around $100 billion every year, according to a report from the Center for Strategic and International Studies (CSIS). The charges focused on trade secrets stolen from the solar power, steel and nuclear power industries. The charges from the DOJ focused on five corporations and entities based in Pennsylvania, including Alcoa, U.S. Steel Corp., Westinghouse, Allegheny Technologies, and the United Steel Workers Union. Solar World, a German-based company with facilities in Oregon, was also reportedly targeted. The decline of the U.S. steel industry has coincided with record steel production in China. In Braddock, Pennsylvania, where Andrew Carnegie built his first steel mill, the alleged actions of the PLA rubbed Mayor John Fetterman the wrong way. “The fact that we’ve lost so much and now they’re actively hacking and trying to steal trade secrets with the little we have left is just outrageous," Fetterman told NBC News. More than 20,000 people lived in Braddock before the steel industry's decline in the 1970s. Now, only around 2,500 people call the town home. Fetterman said that his city "stands as a sad reminder of what happens if we don't confront unfair — and today, illegal — acts of targeted economic sabotage." "Braddock simply can't afford to lose this round too," he said. "There literally won't be anything left to fight over." Can the U.S. actually punish any of these hackers? “The U.S. government understands that the likelihood of successfully prosecuting any of these individuals is effectively nil,” David Fidler, a fellow at the Indiana University Center for Applied Cybersecurity Research, told NBC News. 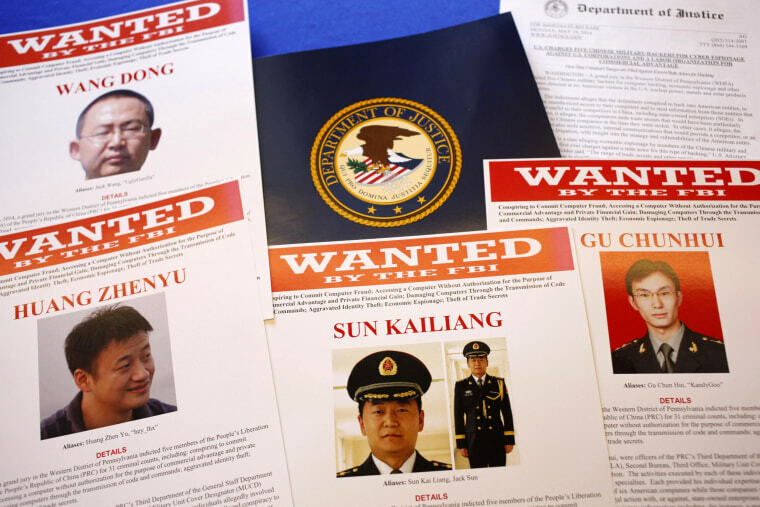 The U.S. government has prosecuted Chinese nationals for economic espionage in the past, like Greg Chung, a Chinese-born engineer for Boeing who was sentenced in 2010 to more than 15 years in prison for stealing information on the U.S. space program. But it’s much harder to prosecute someone who lives in China. China might be an economic juggernaut, but it still is playing catch-up to Western countries when it comes to technology and infrastructure, James Andrew Lewis, director of the Strategic Technologies Program at CSIS, told NBC News. “It would take China decades to reach their level if they had to rely on its own talent and institutions," he said. While China has felt public pressure over economic espionage since at least 2010, when Google complained to the U.S. government about being hacked, the revelations from former National Security Agency contractor Edward Snowden helped provide Chinese officials with political cover, said Fidler. From China’s point of view, the NSA snooping on communications from foreign officials is not that different from hackers infiltrating U.S. corporations. Why bring these charges up in the first place? The Chinese Foreign Ministry has already claimed that the DOJ's charges are "made up." It's unlikely that anybody will see jail time. But that does not mean that the agency's actions are futile. Chinese corporations could start to see stolen information as a "cyber-albatross" around their necks, Fidler said, especially as they look to gain legitimacy in the global marketplace. As for U.S. corporations, they should be glad the U.S. government is acting, Lewis said, because they know cyber espionage is a problem, but fear losing out on the lucrative Chinese market if they speak out. "If this is a first step, it’s a really good first step," Lewis said. Similar pressure has caused other countries suspected of economic espionage — including Russia, France and Israel — to back off, he said. "I don’t expect China to stop spying," Lewis said. "The goal is to get them to scale it back." Matthew DeLuca of NBC News contributed to this report.